Outer: (19.8 x 15.5 x 5.4) in.Inner: (18.4 x 13.3 x 4.1) in. Outer: (19.8 x 15.5 x 7.5) in.Inner: (18.4 x 13.3 x 6.2) in. 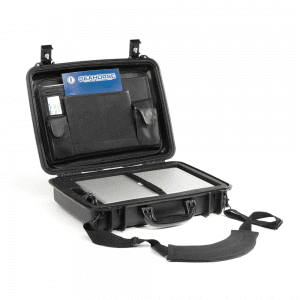 Seahorse laptop cases offer maximum protection and convenience for your mobile office. These shock absorbing, hard cases protect your laptop from outside intrusions and ensure your electronics are safe from water, dust and other elements. Your laptop sits securely on top of a shock absorbing tray, precisely cut out to accommodate your power supply, cables, tablets and other accessories- all in organized slots and pockets. 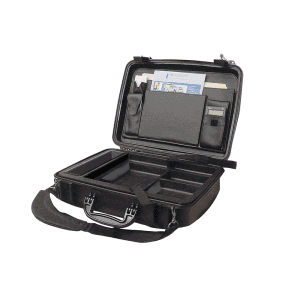 Seahorse makes it easy to travel with an all in one office case. All laptop cases come with a padded shoulder strap, shock absorbing liner for your laptop, lid organizer and keyed chrome metal locks for added safety. 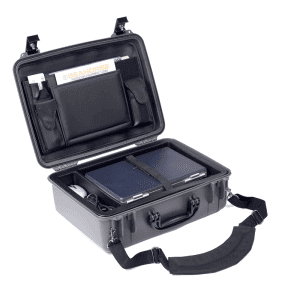 Seahorse cases are designed to be waterproof (IP 67 or higher), have automatic pressure release valve to protect the interior contents from damage, are dustproof and crush resistant.